The sun is out longer, the crispness in the air is fading, and the open road is starting to beckon. Like you, I have been waiting for this entire winter for the snow to disappear. Each time I walk by my bike in the garage, I look at her longingly and smile from the memories of last year’s adventures, excited to make new ones this year. Even if you spent hours before the snow settling your bike in for the long cold winter take the time this spring to get it ready for the first ride. 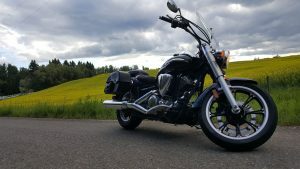 Most articles I’ve read give you advice for getting your motorcycle ready but few mention anything about the rider. Make sure not only is your bike ready to enjoy the freedom but you are as well. Here are some tips for getting primed for riding this summer. Start with your engine. Any gearbox and engine oils should be replaced. Many manufacturers recommend you change the oil before and after storing it for an extending period of time. This is due to the fact oil can separate and cause condensation build up that could harm your engine. At the very least, make sure you check the oil level before heading out. It is suggested that the battery is stored connected to a trickle charger to prevent battery drainage. If this was not done over the winter, ensure you take the time to check it and replace it with a new battery if necessary. While your checking that, have a look at all the lights on your bike as well and replace bulbs or the entire light if needed. Brakes should be cleaned with brake cleaner and if you can, bleed the brake fluid to force out any air in the lines. Examine the lines for any cracks or leaks and replace if needed. Check the condition of the brake pads and discs or shoes to see if they are thin. If so, you will need to either replace them or book an appointment with your favorite motorcycle mechanic. Lubricate the front brake hand lever and throttle cables as well. Check tires for cracks, bulges, stress marks, or flat spots. Inspect the tires as well to see how much tread is left. Make sure the tire pressure is filled to the manufacturer’s recommended pressure. helmet, it needs to be replaced and manufacturers recommend replacement, no matter how it looks every 7 years from production date, and after 5 years of use. The rest of your gear is just as important to make sure there are no holes in your boots, you’ve got a good set of gloves, your protective pants still fit comfortable, and the zipper on your jacket still does up. 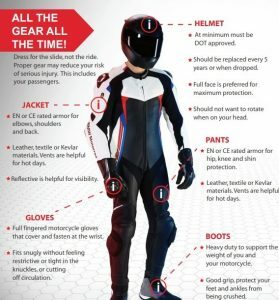 Don’t let your first ride out in the spring be ruined because of inadequate gear. Are your bike insurance and registration up to date? Nothing will ruin a good time like a hefty ticket. It is easy to get excited and overlook the essential tool necessary to riding; YOU! After months of not being in the saddle, your skills may need a little brushing up on. Practicing a bit of deliberate braking and cornering in a parking lot will definitely help with muscles memory and wake up that brain from months of hibernation! Signing up for rider course is another excellent way to get back into the riding mojo. Whether it’s Motorcycle First Aid or an advanced rider training course, both are great tools to have under your belt as you ride off into the sunset. 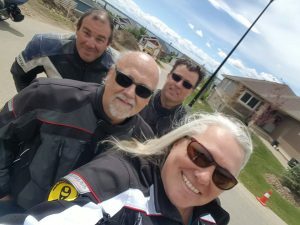 Although all of our Corporate Member riding schools provide a variety of courses, last year I did the advanced riding course with the Alberta Safety Council. This year I got my emergency first aid certificate thanks to Head On First Aid and Safety who did a great job at covering motorcycle specific first aid. And don’t forget your AMSS membership! The number of close calls a rider will experience is higher in the spring because drivers haven’t seen us all winter. Sure we go through the re-education of the importance of shoulder checking and the inattentional blindness where drivers fail to notice us. Make sure you are using lane positions that put you in plain view and it wouldn’t hurt to wear some bright gear. There is also the condition of the streets in the spring where sand and salt are still on the roads not to mention busted up pavement and massive potholes to watch out for. Just like riding in the autumn, dress in layers. The temperatures can drop quickly and you don’t want to suffer from hypothermia. All of our Corporate Members can help you out with gear, courses, insurance and more. Please consider supporting those who support motorcycle safety and awareness. For a full listing of Corporate Members click here. To join AMSS and also see where you can get a discount for being a member, click here. Now you are ready to enjoy the freedom of riding once again!